To apply for membership of APIEM complete the application form on this website and send it to contact@theapiem.com. To become a Member of APIEM applicants will need to have two years experience of working within the MICE/events industry. For Fellowship applicants will need to have more than two years experience of working within the MICE/events industry. Members and Fellows of APIEM will benefit from joining an international network of MICE/events management professionals and will be able to use their membership as evidence to future employers of their accredited experience within the industry. Each APIEM Institutional Member or APIEM Accredited Centre of Excellence is required to pay a registration fee of US$ 15.00 for each student studying on an events management or related academic programme at the institution. This is a once only fee for each student who commences their studies in 2016 – 2017. Each student will receive an APIEM Student Member polo shirt and access to the APIEM Facebook site for students where they will receive relevant events management information about the international events industry to help them with their studies. .
Each APIEM Member or Fellow is required to pay a membership fee of US$50.00 that entitles him or her to two years membership of APIEM. Each APIEM Member of Fellow will receive an APIEM Member or Fellow polo shirt and access to the APIEM Facebook site for Members, Fellows and Industry Members. The Facebook site will enable Members and Fellows to communicate with each other and allow Industry Members to advertise events industry job opportunities. 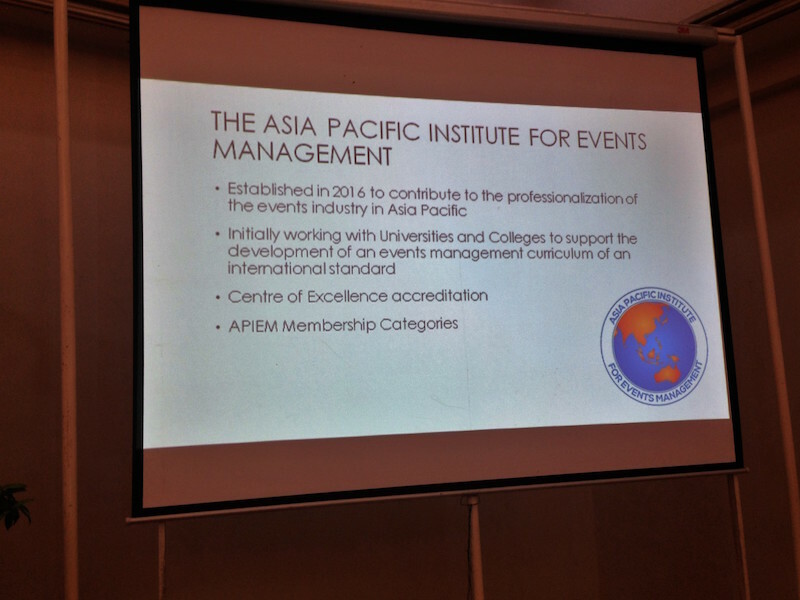 Educational and training organisations and events industry organisations can become Institutional Members of APIEM through the payment of a membership fee of US$500. This entitles the Institutional Member to receive two years membership with three members of its faculty or events professionals receiving APIEM Membership or Fellowship status. APIEM Institutional Members will be promoted as such through the APIEM website where there will be a link to the Institutional Members website. The Institutional Member will receive an MoU from APIEM that will enable the Institutional Member to collaborate with APIEM on events management curriculum design and development. APIEM Institutional Members will be able to use the APIEM logo on their promotional and publicity material including their website. Educational and training organisations can apply to become an APIEM accredited Centre of Excellence that endorses its events management curriculum as being of an international standard. The audit fee to achieve Centre of Excellence accreditation is US$1000.00. This fee enables the APIEM Centre of Excellence logo to be used by the institution for four years and entitles six faculty members to become APIEM Members of Fellows for four years. APIEM Centres of Excellence will be promoted as such through the APIEM website where there will be a link to the Accredited Centres website. The Accredited Centre will receive an MoU from APIEM that will enable the Centre of Excellence to collaborate with APIEM on events management curriculum design and development, and joint research with other accredited Centres of Excellence and APIEM executives. APIEM Centres of Excellence will be able to use the special APIEM Centre of Excellence logo on their promotional and publicity material, their website and course and module/unit handbooks.